Over the course of the 18th century, sugar became integral to the British diet, and our Cookbook of Unknown Ladies is crammed with recipes for sweet puddings, cakes, biscuits, syrupy drinks and sauces. Georgian kitchens burst forth with sugary delights, from cheese cakes and blancmanges to exotic beverages and that wildly popular treat, hot chocolate. But there was a dark side to the nation’s sweet tooth, as it fuelled the intensification of sugar cultivation in the West Indies. With the growth of the plantations, more and more Africans were transported across the Atlantic to work the land. Sugar cane farms had sprung up in the Caribbean in the mid 17th century. A century later, much of the land in the West Indies was devoted to the culture and trade of sugar, and the business of growing, harvesting and transporting the produce of these extensive plantations required veritable armies of labourers. The vast majority of these workers were acquired through an international trade in slaves. 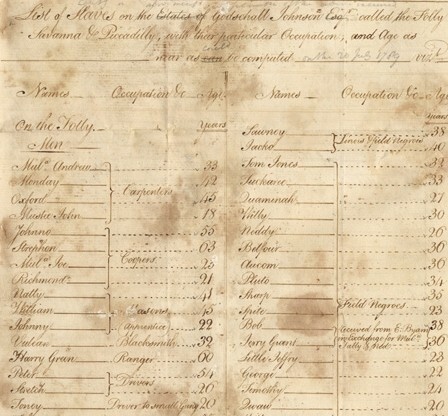 An inventory of Mr Godschall Johnson’s estate in Antigua, taken in 1788, itemises each slave on the plantations along with their designated occupation. Carpenters, coopers, grooms, carters, seamstresses and cooks were needed to support the main work of the plantation: cultivating, harvesting and processing the crop. Those two young to work in the field were made to pick grass to feed the working horses and mules on the farm. In total, the workforce of slaves numbered 254. 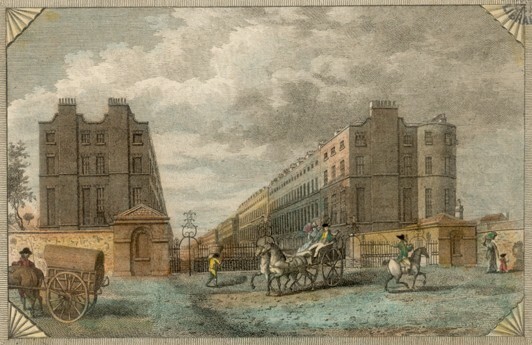 Devonshire Place and Wimpole Street, as seen from Marylebone Road in 1799. 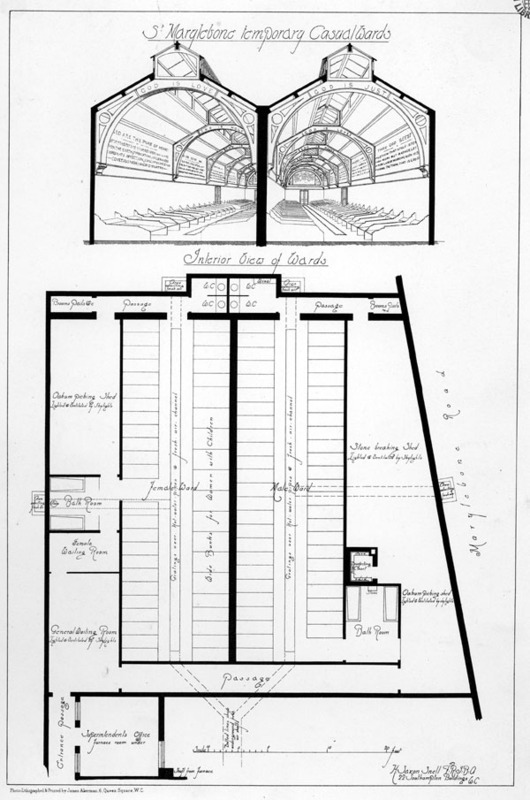 Image property of Westminster City Archives. There was also the wealth that this triangular trade in sugar and slaves brought to London. Godschall Johnson was just one of a large network of slave-owners who lived in Marylebone. 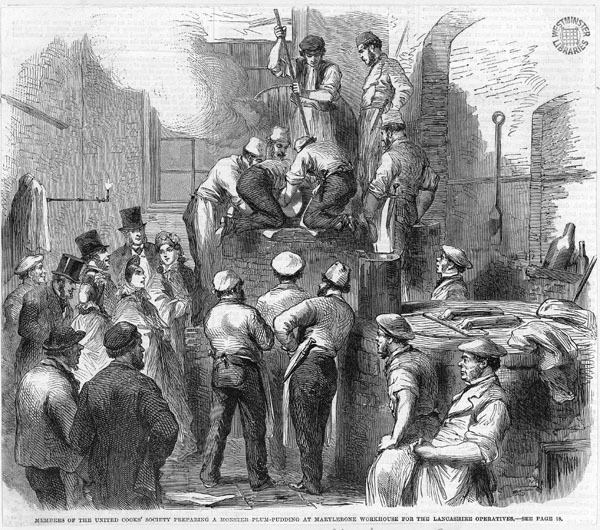 Considered ‘new money’, the sugar magnates of the Caribbean had difficulty integrating into wealthy Mayfair society, and so set up their households in the new areas of Harley Street, Wimpole Street and Portland Place. 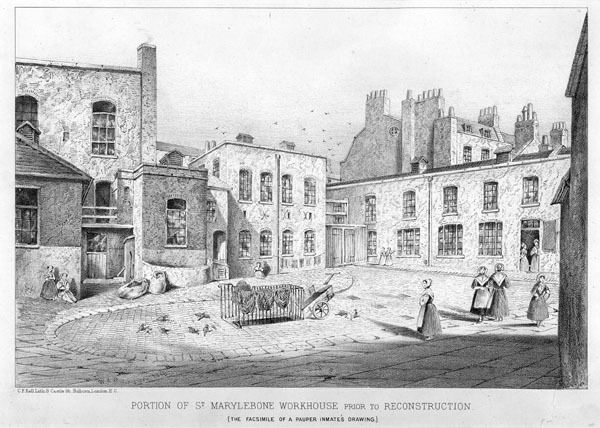 Even after the Slavery Abolition Act of 1833, there was little official recognition of the damage that had been caused to the lives of those enslaved, and the plantation owners of Marylebone were heavily compensated by the government for the loss of their human property. It is a sobering thought that many of the most prestigious addresses in Marylebone were built on money made through the use of slave labour. You can find out more about Westminster and the transatlantic slave trade by taking a look at our online exhibition. Have you ever made your own cheese? Cheesemaking seems to have been a common activity in the 18th century kitchen, as our Cookbook of Unknown Ladies provides us with a multitude of recipes for preparing soft cheeses. Today we’ll explore two recipes handed down from ‘Mrs Lewis’ and ‘Mrs Hayne’. The nettles in this recipe are used to aid the ripening process, but this natural covering would also lend its delicate flavour to the cheese. Mrs Lewis’s recipe is thorough, and offers an insight into the time, knowledge and skill required to make good home-made soft cheese. Our second recipe today, attributed to a ‘Mrs Hayne’, is sketchier but no less fascinating. Take 12 quarts of strippings, 2 quarts of cream, 2 spoonfuls of the juice of marigolds and about a teaspoonful of rennet. So whey it and press it as you do other cheese, shifting it every half hour with dry cloths. Mrs Hayne’s recipe asks for milk ‘strippings’, the last milk drawn from the udder, which has a high cream content. 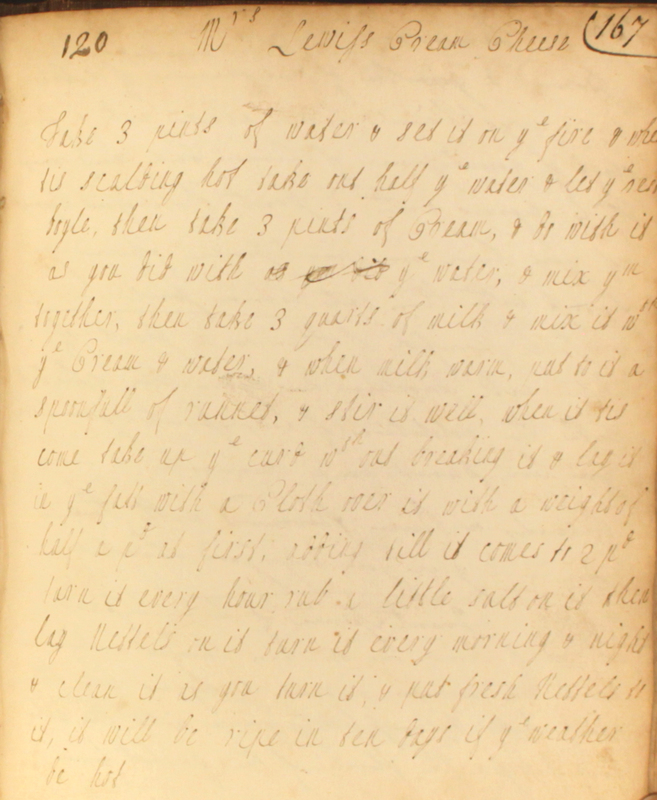 This suggests that the recipe was written for a household keeping its own cow, or ‘neat’. It is quite likely that the ‘unknown ladies’ who compiled our cookbook lived in households that kept a number of domestic animals, or even managed a small farm. But even with this land and rustic lifestyle, they could quite easily have been living in and around London. By the mid 18th century, much of the Parish of St Marylebone still consisted of fields, common land and small rural settlements. 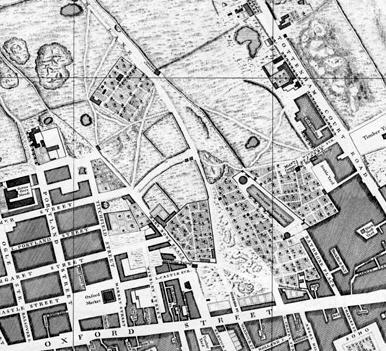 London’s urban development petered out half-way along Tottenham Court Road, as shown in John Rocque’s map of 1746.